We’re excited to be promoting the first Manchester show of 2013 for Liverpool’s Bird. Three-piece Liverpool band Bird is the creation of Adele Emmas (singer, songwriter), Sian Williams (guitar, harmonies) and Alexis Samata (drums). Together they create dark, haunting, atmospheric music that will entice you in to their magical, otherworldly universe. 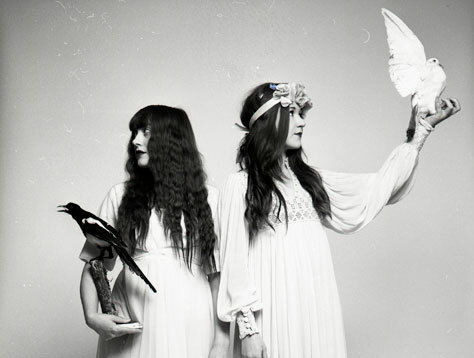 With beautiful, siren-esque vocals, tribal, hypnotic drum beats and spell-binding guitar work, Bird are refreshingly unlike anything that’s currently on the music scene. After bumping in to each other at a gig one evening, Adele and Sian bonded over their mutual love for artists such as Leonard Cohen, Kate Bush, The Cocteau Twins, Warpaint and Fleetwood Mac. The girls swapped numbers and soon after songwriter Adele and drummer Alexis invited Sian along for a jam where they realised together they had something very special to give. The trio have since gone from strength to strength after signing to independent record label Jack To Phono Records on which they released their first EP Phantoms back in November of 2011. During their 2011 tour, alongside their sold-out EP launch, the band have built up a large, loyal fan base in their home town of Liverpool and other areas of the UK. After recently releasing their second critically acclaimed EP Shadows, the band are now starting to make waves across the globe. Radio stations including Radio 1’s Rob Da Bank, BBC 6 Music (Maconie and Radcliffe, Tom Robinson and Steve Lamaq) and Simon Raymonde (Cocteau Twins/Bella Union) on Amazing Radio have all recently featured Bird on air. The band have also had their music featured on Channel 4 and have had various magazine articles published in NYLON magazine, Bido Lito and many more. After being selected by the BBC, Bird attended a musicians workshop at Abbey Road and Maida Vale Studios. Support comes from Rachel Hillary, a singer-songwriter from Manchester. Describing her music as ‘poetry set to song’, Rachel relies on spontaneity as a source of inspiration, much like the Beat poets; all kinds of great things can happen by accident. Fans of Feist, Birdy, Melanie Safka and Bob Dylan will find Rachel Hillary a complimentary addition to their (already impeccable) musical interests. Opening this show are Tiny Parcels, a new Manchester-based duo made up of two girls, Emma Lomax and Hayley Faye. They play a quirky combination of pop with fast-paced skiffle songs on the guitar and drums. The pair have been playing music in various different bands in and around Manchester for years but teamed up to form Tiny Parcels after meeting at a party in Salford. They are influenced by, among others, The Andrews Sisters, The Beatles, The Beach Boys, The Smiths, Yeah Yeah Yeahs, The White Stripes, Violent Femmes, Pixies, The Breeders, The Ramones, Sultans of Ping FC, Nancy Whiskey and the great Lonnie Donegan. Buy tickets now. Tickets are also available from the bar, Common (both no booking fee), Piccadilly Records, Vinyl Exchange, Seetickets.com, WeGotTickets.com, Ticketline.co.uk and on 0871 220 0260.